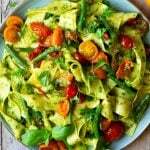 Pappardelle pasta with green beans, cherry tomatoes and parsley pesto. This simple pasta sauce is ready by the time the pasta is cooked and it couldn't be easier. It's simple, fresh, flavourful and perfect for weeknights! Meanwhile make the sauce, add the cherry tomato, green beans, chilli flakes, salt and pepper to a large pan and cook on a medium heat until the tomatoes soften and start to create a sauce. Add the fresh pasta to the boiling water and cook according to packet instructions (around 3 mins). Once cooked remove with tongs from the water to the tomatoes and toss to coat. Add the pesto and toss again until completely covered in the sauces. Serve. Remove the pasta from the water with long tongs instead of draining. This way the excess pasta water emulsifies the sauce without diluting it too much. Alternatively, keep 1-2 tbsp of water, drain the pasta and add it to the sauce if necessary. Don't cook the tomatoes on too high a heat, they start to caramelise and go sticky instead of saucey. Keep them on a medium heat. Make the pesto in advance (even the day before and keep it in the fridge).